On behalf of the Black Lives Matter at School Coalition we are writing to thank everyone for a powerful week of action from coast to coast. Because of the bravery and tenacity of many thousands of educators, students, parents, activists, and organizers, BLM@School week was bigger and more impactful than ever before. It is truly stunning to visit #BlackLivesMatterAtSchool on Twitter and see all the photos and stories of communities around the country reclaiming their schools, affirming Black students’ lives, and challenging anti-Black racism. We were especially moved by the intersectional approach to fighting racism that so many schools engaged in with lesson plans to teach about, queer, transgender, female, and immigrant, Black people. At the same time, during our week of action a girl at a Pennsylvania High School was grabbed by the hair and slammed on the lunch table by a police officer. This incident, the many recent like it, and the on going inequities in the public schools are bitter reminders of work left to do. 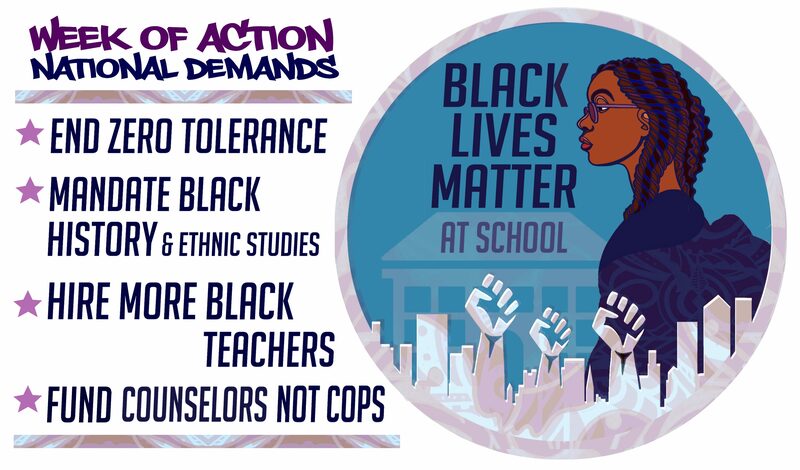 It is our hope that the BLM at School week of action can serve to jump start activism and pedagogy to transform the school system and dismantle institutional racism—but we know that this work can’t be confined to week if it is going to be successful. We must use the week to launch on going initiatives for ethnic studies, restorative justice, hiring more Black educators and counselors, to get police out of the schools, and more. Yet there can be no doubt that this movement has begun. The Black Lives Matter at School week of action reached more than 30 cities; we engaged tens of thousands of students in lessons about the 13 principles of the Black Lives Matter Global Network; we held rallies at local school board meetings and city halls around the four national demands; and we organized forums, youth talent showcases, and speak outs to educate the community and empower young people in the movement. Below is a round up of some of the many national and local news stories of the Black Lives Matter at School movement from cities around the country. Thank you for your dedication to Black education for liberation!